the Knowledge Master Library. Create tests and quizzes, stage academic competitions and develop cooperative learning activities with more than 140,000 questions cross-referenced to thousands of topics. 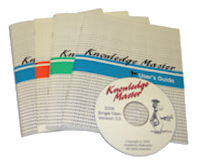 Knowledge Master is practical, comprehensive, and easy to use. Grades 5-12 for Windows or Macintosh. We provide high-quality tournament and practice questions to thousands of quiz bowl teams every year. New School Package ($99, free shipping) Over 2,500 practice questions for new players and teams. Middle School and High School editions are available.